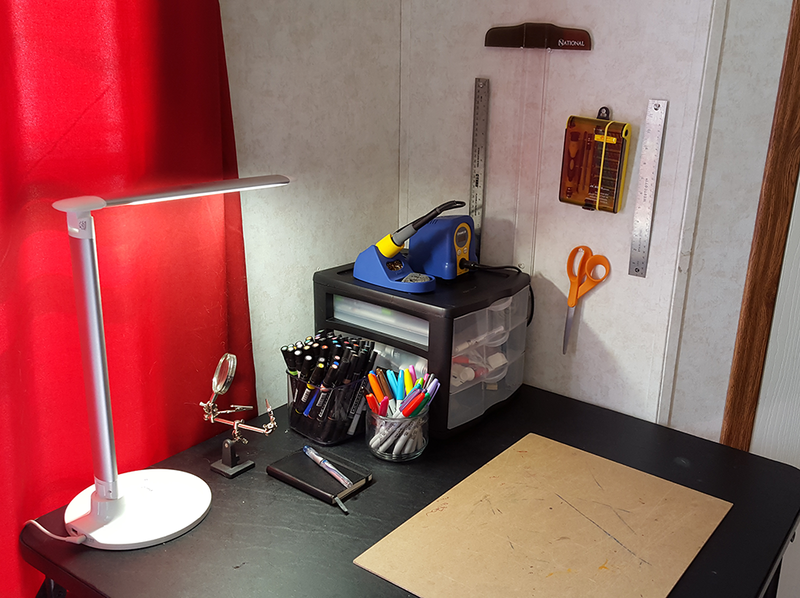 A while ago I set up a little corner of my office for doing creative projects, artwork, small electronics, etc. It's been great, but I still find that I haven't been doing as much artwork as I'd like and part of the reason is just that it's still a pain to drag everything out. 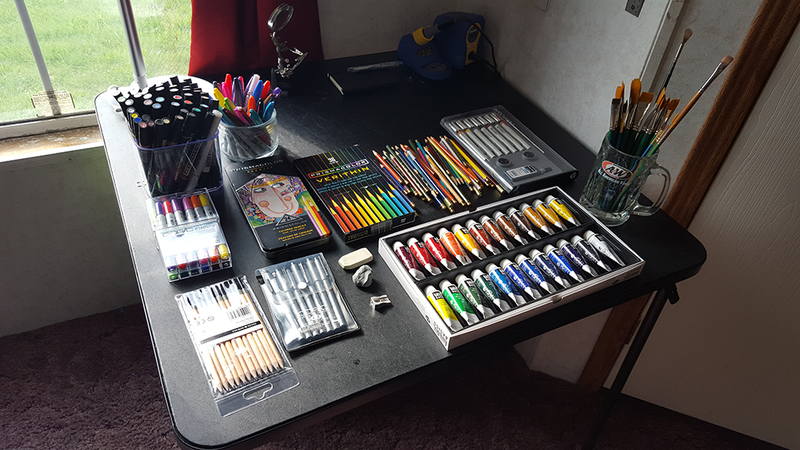 So today I decided I would get my art supplies organized and set them out for easy access and use. First up, I decided to take inventory and lay everything out and see what I had for art supplies. Getting this organized was going to require additional storage. 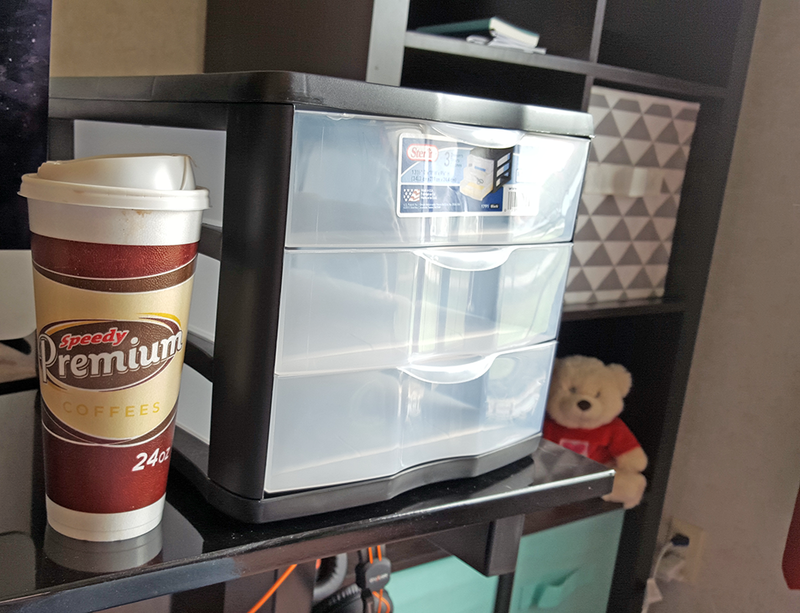 I made a quick trip to the store for a small drawer unit and coffee. Lots of coffee. 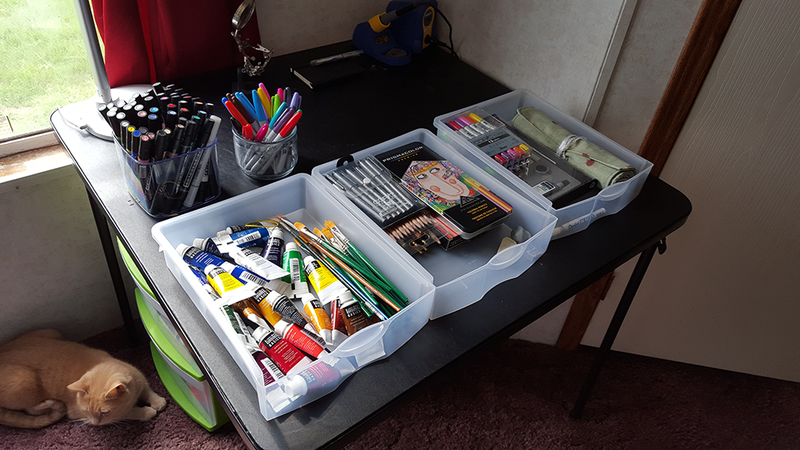 Paints in one drawer, drawing supplies in another, and the the 3rd drawer is just kind of leftover marker/inking supplies. It all takes up more space on the table than I would like, but it's space not typically used anyway, since I tend to work on smaller pieces. I'll give it a try for a while. If I find myself needing to move things around a lot and running out of room, I'll have to come up with something different, but for now, I like that everything is in easy reach. Having done that, I decided that since I was on a roll, I'd go ahead and take another pass through the drawers under the table. 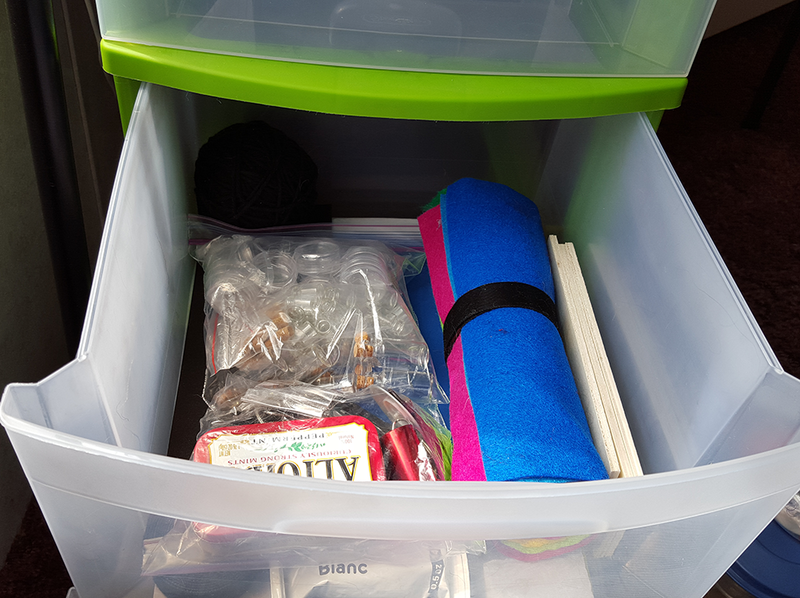 I kept some things when I set up the corner that I'm realizing I'll never use, so I thought I'd purge a few things and make the drawers more organized. Miscellaneous paper stock, duct tape, and spare office supplies. "Raw Materials" or things that can be used to make other things; fabric, foam, wood, etc. 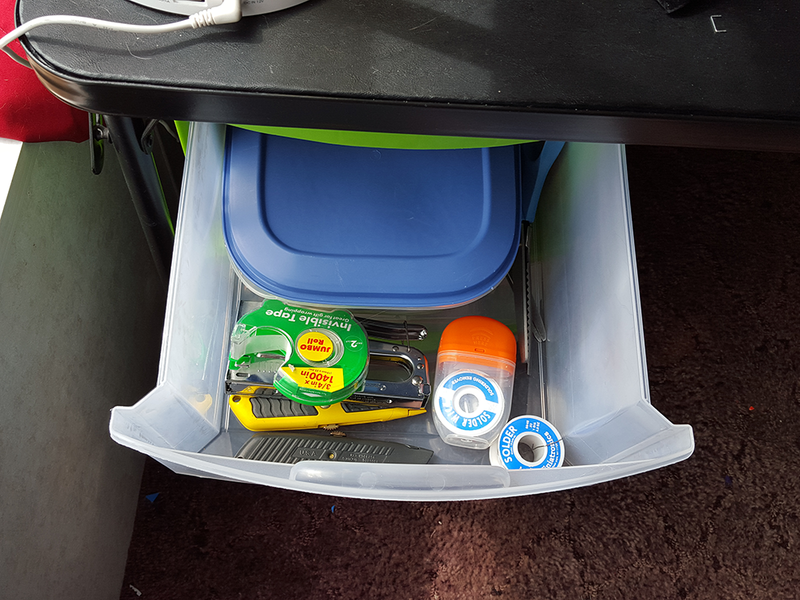 I also tossed glue guns and bags of glue sticks in this drawer (not pictured). 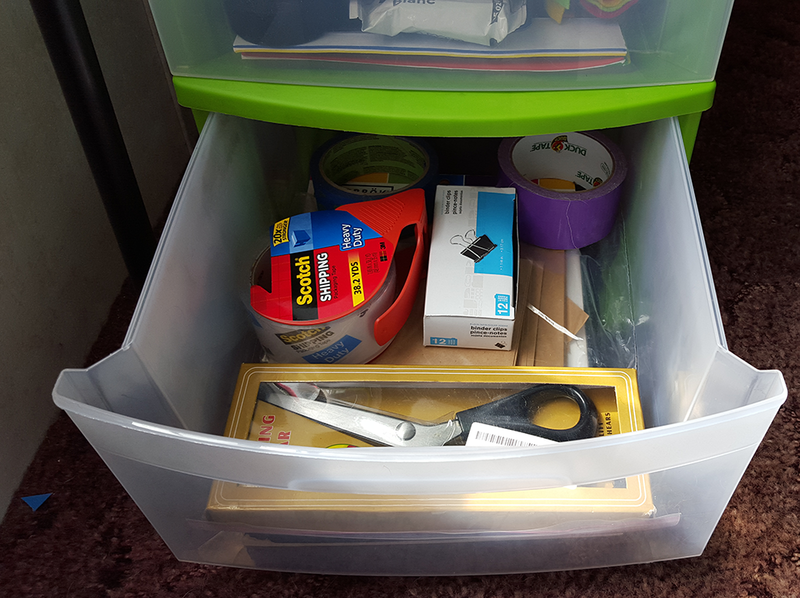 Small hand tools (mostly in the blue container), sewing kit, solder & soldering iron tips, shears, utility knives, sandpapers, etc. 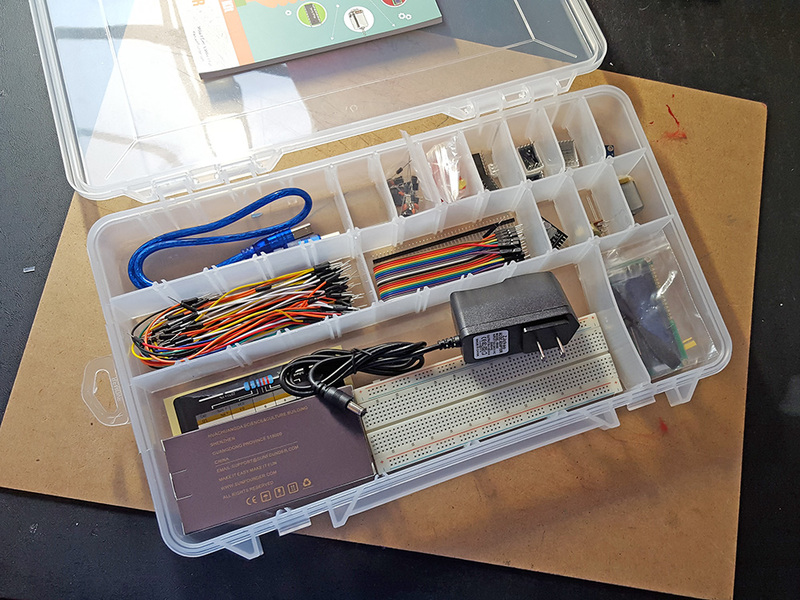 And then of course some Arduino goodies in the tray on top of the drawers. Time for a new spaceship?